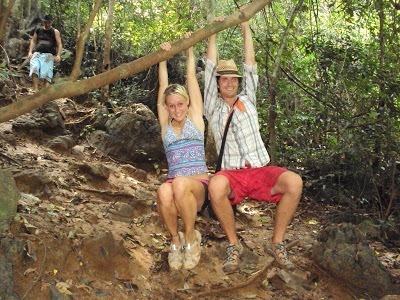 This Vietnam eco tour proposes you many different things which a classic adventure itinerary doesn’t have. 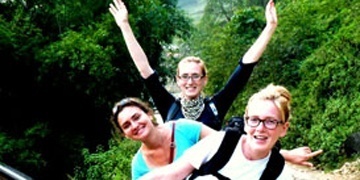 Experience different aspects of Vietnam culture and daily life and many chances to learn from local people, act as a local and experience in the same way the locals do. Many outdoor activities are inclusive and exclusive. Local homestay, eco-lodge and cozy hotels narrow the gap between a foreigner and this Far East country. Private pick-up by our tour guide and private driver at Hanoi airport, then transfer to Hanoi city center to check in your hotel. Afternoon walking tour in Hanoi Old quarter visiting Dong Xuan market, Bach Ma temple, O Quan Chuong Old city gate, Kim Ngan Jelwery communal house, Old House 87 Ma May street, Ngoc Son temple and Hoan Kiem lake. End of day, we attend the performance of the famous Vietnamese traditional art of water puppetry at Thang Long theatre. Enjoy welcome dinner & Overnight in Hanoi. Morning city tour starting with the Ho Chi Minh Complex, containing the mausoleum of the nation’s founder Ho Chi Minh, the Presidential Palace, the Ho Chi Minh stiled-house, Ba Dinh square where Ho Chi Minh declared the Independence of Vietnam on 2 Sep 1945. Visit Vietnam museum of ethnology in Top 25 museums of Asia listed by TripAdvisor, dedicated to Vietnam’s 54 ethnic groups, which brings you a good overview at Vietnam diversified cultures and traditions. After lunch, you’re privately transferred to Halong city through the Red river delta. On the way, we may stop enroute to admire the local rice fields. Arrive at Halong hotel in the late afternoon and overnight in Halong. Day 3 Ba Hang fishing village - Cat Ba islands - Cat Ba Eco-lodge (B,L,D) - Activities: Kayaking in Ba Hang fishing village, Cycling in West Cat Ba National park. After breakfast, you’re transferred to Bai Chay tourist wharf, boarding a day boat sailing around Halong Bay, a World Heritage with thousands of limetstone and dolomite island and islets. Visit Ba Hang, 1 of the 4 famous fishing villages of the bay. This is home to about 80 households living offshore. You will try kayaking around the village with stops to visit a family and the floating school. Kayaking among the hidden areas of the bay, around the Burning Incence rock islet, the symbol of Halong bay. Back to the boat for a typical Vietnamese lunch with “Nem” Vietnamese spring-rolls and seafood. Relax or snap photos as the boat crosses the most beautiful part of the Bay. Disembark in Gia Luan harbour, North of Cat Ba islands. Private transfer with our tour guide to Ang Soi intersection in the edge of Cat Ba National Park. 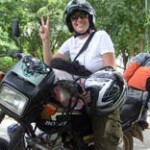 Take over the bike and start easy-cycling from Ang Soi to Xuan Dam village along the mountain side and wide beaches. You also passing through the damps where locals raise-up shrimp, fish and crabs. End of the cycle inside Xuan Dam village (total 6km cycling). Check in Cat Ba Eco-lodge (formerly named “Suoi Goi Eco-lodge”) inside Xuan Dam village. Dinner is pre-arranged in the Eco-lodge because there aren’t restaurants in the village. Overnight in Cat Ba Eco-lodge. Start your day with a jogging the rice fields of Xuan Dam village to enjoy the fresh atmostphere of a new day in the countryside. Lunch and check out Cat Ba Eco-lodge. Private transfer to Cat Ba downtown. You take the highspeed boat to Hai Phong city (45 minutes) with our guide. Arrive at Hai Phong harbour at 14:30 then private transfer to Hanoi. Overnight in Hanoi. Morning check out at 10:00 then private drive uphills to Mai Chau valley, home to White Thai hilltribe on the Northwest mountain range. Enroute stops on Thung Khe and Thung Nhuoi pass to take photos of the Mai Chau town below. Only 140km from Hanoi, the valley is where you can find out everything about the traditions of White Thai ethnic people. Arrive at Lac village or Pom Coong village in the afternoon. Check in a local stilt-house of White Thai. Say hello to the host and relaxation. Dinner with traditional food of White Thai hilltribe then join the dancing and singing show performed by villagers. Homestay overnight in the stilt-house in Mai Chau (Dorm-room). After 1 hour flight, you meet our guide then private transfer from Da Nang airport to Hoi An Old quarter. Overnight in Hoi An. Guide pick guests up at hotel, take bicycles along De Vong River to Cam An wharf. Embark on the boat to Cua Dai sand dune, enjoy casting net show and learn how to cast net by local fisher man. Continue to Cam Thanh Water coconut village, have a brief introduce to the history there. Take on the basket boat along the water coconut river. Fisherman will teach you how to catch the crabs (02 paxs/ boat). Divide our group into 2 teams for basket boat racing and catching crabs. There will be a lovely present for winner. Embark on the boat, enjoy the folk songs show by local people and learn how to make funny tools by water coconut leaf. Then get on board to Cam An wharf, continue to take a bicycle to Tra Que village and join in the daily activities with local farmer there. Enjoy special local food such as pancake, Tam Huu spring roll, fried fish … in Tra Que herb village. Bidding farewell, take a bicycle back to your hotel. Morning walk to visit the ancient architecture of Hoi An – known as a fascinating combination of Vietnamese traditional characters with Chinese and Japanese influence.There are plenty to see in this delightful town, some of which are the famous Japanese Covered Bridges, the Pottery Museum, the 200 years old Tamky House, the Chua Ong Pagoda, the vibrant market. Return to your hotel to check out then private transfer to Da Nang airport for the onwards flight to Saigon, the entertainment center of Vietnam. Arrival Saigon, you meet with our guide then transfer hotel for checkin and refresh. Afternoon sightseeing tour of Ho Chi Minh, starting by Notre Dame Cathedral and façade of the former presidential palace. Stop at Ben Thanh market for shopping. Dinner at leisure (not included in tour price). 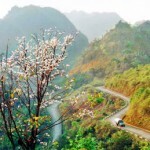 Leave Saigon, enjoy the scenic journey along the National Highway bordered by green rice fields. On arrived at My Tho, visit Vinh Trang pagoda, take a leisurely boat ride along the river, view stilt houses, fruit plantations and fishing villages along the river bank. Proceed to Tortoise islet, have lunch in the orchard garden. Then a boat ride to An Khanh – a less touristy attraction in Ben Tre, enjoy cruising on a hand-rowed sampan under the shade of the water coconut trees along natural canals, then enjoy seasonal fruit & honey tea to the sound of “Southern Vietnamese folk music”, performed by the locals. Visit a family business which epitomizes the idyllic rural lifestyle, taste delicious coconut candy & observe the pastoral life as you roam through fruit plantations and villages. Proceed to Can Tho. Overnight in family home-stay (homestay – private room). Have you ever tasted Vietnamese vermicelli soup? Well, now go and see how it is made. Then wander around the village and meet the friendly local people and experience how to pass a “Monkey bridge” which is built by only one stem of bamboo. Visit the orchard garden. Stop for lunch. 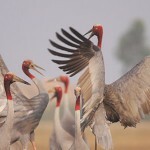 Proceed to Chau Doc, continue the tour to visit Tra Su, getting to the wild birds Sanctuary, cruising smoothly with small boats to discover the arrays of splendid canals deep into the forest, watching storks, cranes and other tropical birds. On the way back stop by to visit Sam Mountain, the Cave pagoda (if time permitted). Back to the town, hotel check in. Overnight in Chau Doc. ” state=”closed”]After breakfast, take a nice boat trip through the floating village to visit a fish farm to see how the Mekong Delta people raise fish in their floating houses. Visit the Cham minority with their traditional weaving village, followed by a local Islamic Mosque. Trip back to Saigon. See-off at your hotel in Saigon. ” state=”closed”]Free at leisure until transfer to Saigon airport (no guide). Transit then take your departure flight. Say goodbye to Vietnam and see you next time. End of services.